Star Wars: Legion is an objective based game. It does not matter how much of your force has been destroyed or how much of the enemy force you have destroyed; when the game comes to an end if you have one figure left and more objective points then your opponent, you win! 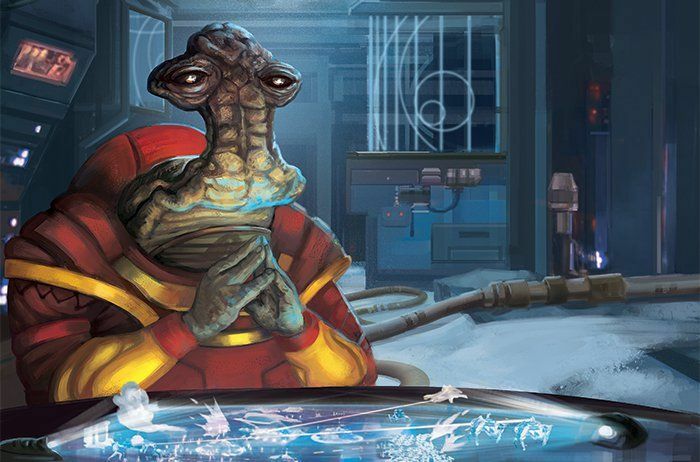 For that reason understanding Mission Objectives is possibly the most important skill in SW:L.
In a competitive game you and your opponent both bring a deck of 12 mission parameters (4x of each: Objectives, Conditions, and Deployment) and will play a mini game to determine which mission is being played (often reffered to as turn 0). The player who's list is the lowest points gets to chose if they are the red player or the blue player, and then the blue players scenario deck is used. Because there are more than 4 of each parameter there are some strategies when choosing which to include in your deck, and also when choosing which to keep and which to eliminate during the mini game to determine the actual mission played. Keep in mind that your individual play style and list composition will determine which mission parameters will favor you most. The player with the most unit leaders in the enemy deployment zone at the end of the game wins. The end of the game can either be the end of turn 6 or the end of the turn after the match time has ended. Note that every unit is its own unit leader so vehicles and single model units like commanders count. Also note that a unit leader has to be completely within to count, but you do not need the rest of the unit in the zone to score the point. Breakthrough is mechanically one of the simpler missions, but can be one of the more complicated to actually play. When deploying your force you want to keep in mind that you will have to stop the opponent from crossing into your deployment zone while also having a strategy to get more of your forces into their deployment zone. Often the best way to achieve this is to counter deploy your units opposite of theirs and then keep one or two units off to the flanks. The strategy is to engage the bulk of their force with the bulk of yours and keep them at the center line of the table to stop them from advancing. While the main forces are fighting, your flanking units should be making a slow approach towards the enemy deployment zone. Breakthrough favors lists with a high number of activations and units with above average speed and mobility. If you have more units than your opponent then it is a good idea to try to flank those extra units around the side of the battle field and sneak them into your opponents deployment zone late game. It is important to not push into your opponents deployment zone before turn 5 or 6 and to try to keep as much of the fight as possible in the center of the board before that. If you do make a big move towards your opponents deployment zone early or mid game they will often change their tactics to either move past you and score for themselves or to double back and eliminate your scoring units: both are bad. This is why fast and mobile units are favorable - they can be held further back and be harder to predict where they will push into the deployment zone from. Units with Jump are also key as they can move close and stay safe behind cover before making the dash. In general it is more important to keep the enemy out of your deployment zone than it is to get into theirs, however with more and faster units ideally you will be able to do both. Try to avoid this mission if your list consists of fewer units than your opponent or your opponent has more speed and mobility than you do. It is not an impossible mission to win under these circumstances, but it is very difficult. If you get stuck playing this mission and it is unfavorable to you, it is often a good strategy focus on preventing the enemy from scoring rather than trying to score for yourself. The best way to do this is to set up a defensive position outside your deployment zone and engage the enemy before they can make it through to score, it is also a good idea to engage in melee to keep them from moving. Effectively you are taking the scenario out of play making the objective points 0 on both sides. To be able to win in this way you will have to be able to destroy more of the opponents forces than they are able to destroy of yours to win on the tie breaker. Also keep in mind that you will want to set your troops far enough forward that the opponent can move past them on the last turn to score anyways. Remember that an engaged unit can always disengage and make a speed 1 move which could get them into the deployment zone at the last chance. 1.2.0 Errata KEY POSITIONS This battle card should read: "Setup: Place an objective token on the piece of terrain closest to the center of the battlefield (if multiple pieces are equally close to the center, the blue player chooses). Then, starting with the blue player, each player places 1 objective token on a piece of terrain. Each token must be placed on a piece of terrain that is completely outside all deployment zones and beyond range 1 of any other piece of terrain with an objective token. If a player is unable to place a token according to these rules, they can place that token on any piece of terrain that does not have an objective token and that is outside all deployment zones. If that token still cannot be placed, then it is not placed. Victory: At the end of the game, for each terrain piece with an objective token, the player who has the most unit leaders in base contact with that terrain piece gains 1 victory token." Taking turns the players will put an objective token on a piece of terrain until there are three, the blue player will place 2 and the red player will place 1. The pieces of terrain must be outside of all deployment zones but can be as close together as you'd like as long as they are not the same piece of terrain. At the end of the game the players score 1 point for each piece of terrain that they have more unit leaders touching than their opponent. Note that vehicles and units of a single model can still score this objective as they are their own unit leader. Key Positions no longer heavily favors blue player as of the 1.2.0 update. This objective favors those who can strategically outmaneuver their opponent with a small advantage to lists that bring more units than their opponent. Because blue player gets to set 2, they should be close together (beyond range 1 of each other) and the one that is not near center should be near your deployment zone. It is also a good idea to select the size of the terrain piece depending on if you or your opponent have more units. If your opponent has more units you should select the smallest pieces of terrain possible, such as barricades, to keep them from rushing you at the last moment and placing more units on your terrain to claim your points. If you have more units than your opponent then you should pick the pieces of terrain as close to you as possible. Once the game has begun as the blue player you should move everything towards the contested piece of terrain and set up a defensive position, keeping the enemy units as far away as possible. Don’t forget to leave a unit or two to claim your back piece of terrain. Remember to keep your unit leaders base to base with the pieces of terrain and try to keep any other members in the unit farther back so that you aren't giving your opponent an unnecessary range advantage. No list construction is much better or worse for this mission, although it mildly favors the blue player, it can also be good for the red player if they have more activations or more mobile units. If you are the red player - although it is not an auto loss like it was in 1.1.0. Still try to encourage a deployment zone selection that makes the terrain eligible to be used still favorable to you. If you end up playing Key Positions as the red player, it is a good idea to keep one or two units back near the objective you set favorably for yourself and then make a push towards the other two objectives with the bulk of your army. The best scenario is that for some reason your opponent did not put their objectives near each-other in which case focus on only one of theirs while holding your own. The way you will be able to win this as the red player is by holding on to your objective and then either stealing one of the enemy objectives, or more likely holding on to your objective and forcing a tie (equal number of units) on one of the other two making the the game go to a tie break at which point hopefully you have killed more points. This mission places three objectives equidistant along the half way line of the board. You score the objective by having more trooper unit leaders within range one of the objective than your opponent. Unlike other objectives Intercept the Transmissions is scored multiple times: on turn 2, 4, and twice at end of game. Important things to remember when playing this objective is that only trooper units count towards controlling an objective, and that the final score is at end of game not at end of turn 6, so if the round time ends before turn 6 you score at that time. This is probably my favorite mission to play as it does not strongly favor anyone and the games are always close. The best strategy for playing Intercept the Transmissions is to focus on scoring only 2 out of the 3 objectives, if you can do this you will be ahead of your opponent and win. It is also a good idea to prioritize scoring at the end of the game over being reckless and scoring at the beginning. Often the player who pushes too hard for scoring 2 of the 3 objectives on turn 2 over extends their forces and the opponent is able to deal some damage this turn and get an advantage for the rest of the game. This mission favors lists with more troop units, however it is fairly well balanced and it is not a huge advantage. If the other missions are unfavorable this is always a good mission to push for. If the opponents list contains significantly more troop units than yours (3+) then this is going to be a much harder mission to win and you should avoid it. If you get stuck playing Intercept the Transmissions and the opposing list has significantly more trooper units than you do you can mitigate a lot of this advantage by pushing for the Long March, Major Offensive, or Advanced Positions deployments - because these deployments cut the table long ways or diagonally it makes it much easier for you to claim one and makes the middle objective much more contested. In this scenario you want to push as much of your army forward to that middle contested objective as possible and leave as little as you can at the objective in your back line: a single trooper unit if you can. If you get stuck on Intercept the Transmissions and an unfavorable deployment like Battle Lines then your objective will be to destroy as many enemy trooper units as possible and score with your own trooper units if you can. One objective token is placed in the center of the table and then each player places 2 more tokens, these tokens must be placed beyond range 1 of a deployment zone and beyond range 1 of another token. Trooper units have the ability to pick up an objective using an action if the unit leader is in base contact with the objective. Each player scores 1 point for each objective token they hold at the end of the game. Recover the Supplies is a pretty balanced mission. It slightly favors lists with more trooper units, but the advantage is almost negligible. Because each player gets to place two tokens they should be near their own deployment zones, meaning the real contest is over the fifth token. The strategy here is to place your objective tokens as close together as possible and as close to your deployment zone as possible. Because a unit leader can claim more than one objective the best strategy is to dedicate one unit to claiming both of your objectives early and then moving them somewhere safe so that the enemy cant interfere with them. From this point on your goal is to claim the fifth objective token and keep it away from the opponent. There is another element to this mission though, if a unit leader with an objective token becomes panicked they drop their token and run, leaving the objective token where it was. This makes Suppressive weapons and fast flankers a strong and often unexpected element to this objective. This objective doesn't really favor any particular list. There are some advantages to lists that bring Suppressive weapons, as it is easier to panic an enemy and cause them to drop their objective. There is also a slight advantage to lists that bring fast flankers who can get around the enemy's forces and attack their units with the objective tokens in the back. This is rarely a bad mission to pick. Because of the 3 corps unit minimum plus your commander you should always have enough units to grab your two objectives and contest the fifth objective. If your opponent does have fast flankers or a way to panic your objective carrying unit, you still have a good chance of winning. If you can force Long March deployment it will go a long way to helping keep the flankers under control. Otherwise do your best to keep your objective carrying unit out of LoS and hidden behind terrain, and dont be afraid to send some of your forces back to protect them. Each player will place 2 objective tokens down, beyond range 1 of a deployment zone and beyond range 2 of another objective. Each token will start with 2 wounds on it. Each trooper unit gains the ability to add or remove a wound token from an objective. At the end of the game no player earns a point for an objective with 2 wounds on it, blue player gains 1 point for each objective with 3 wounds on it and 2 points for each objective with 4 wounds on it, red player gets 1 point for each objective with 1 wound on it and 2 points for each objective with 0 wounds on it. At first glance this seems like a mission where each player wants to place their objective markers close to their deployment zone and then try to get one of the opponents for the last point, however it is far more sophisticated than that. A clever player will use the placement restrictions to force the opponent to place their objective tokens in a place that is more favorable to them. Because we know that a table is effectively range 6 by range 12 and the dimensions of the deployment zones and that the objectives cant be within one of a deployment zone or within 2 of another objective we can control where the opponent is able to place their objectives. For example if we are playing Long March and I place my objective close to my deployment zone the opponent is free to place their objective close to their deployment zone and the scenario becomes irrelevant. However if I place my objective at range 2.99 from their deployment zone (essentially middle of table) Then I can begin to control where they are able to place their objective. After I place my first they can then place their next objective favorably near their deployment zone, but the next two objectives will be center of table or closer to my table edge than theirs. This works better on some deployments than others, but the tactics remain the same. The best way to make this work is to try and force 3 of the objectives to be center of table and on a disadvantageous side of terrain for your opponent. Remember when placing the first objective to place it just within range 3 of their deployment, but also that they can't place both their objectives at range 2 of yours or else you just gave them 3 of 4 objectives. Also keep in mind that unlike Recover the Supplies you cant panic a unit away from an objective to neutralize the points they've earned, you will have to actually get a trooper unit to the objective to get the points back. It is also a good idea to place objectives on the far side of terrain from the opponent when possible. Picking what terrain you and your opponent will engage in is the main benefit of this strategy. Because blue player places the first objective this mission heavily favors blue player. It also mildly favors lists with more trooper units and faster and more mobile units. Best on maps with lots of LoS blocking terrain that you can place objectives behind. If you are red player or if you have significantly fewer troop units than your opponent this is a difficult mission. Also avoid if the map has little or no LoS blocking terrain. If you are the red player your best hope is to get a mission with spread out deployment, this way you're are more likely to be able to place your objectives in favorable positions to you If you get caught playing Sabotage the Vaporators on a restricted deployment mission, then it is going to be a hard game. The best strategy in this situation is to try and keep the enemy trooper units from reaching the objectives at the center of the board and claiming as many points as you can as you go. It is a good goal to try and tie the objective points and to kill more of their army points than they have of yours. If you get stuck playing this mission as blue player and the opponents list significantly outnumber your own or you don't feel you have the terrain or placement skill to force this to be advantageous then you can turn this into a less contested scenario by placing your own objectives near your deployment zone, at which point they will place their objectives near their deployment zone.